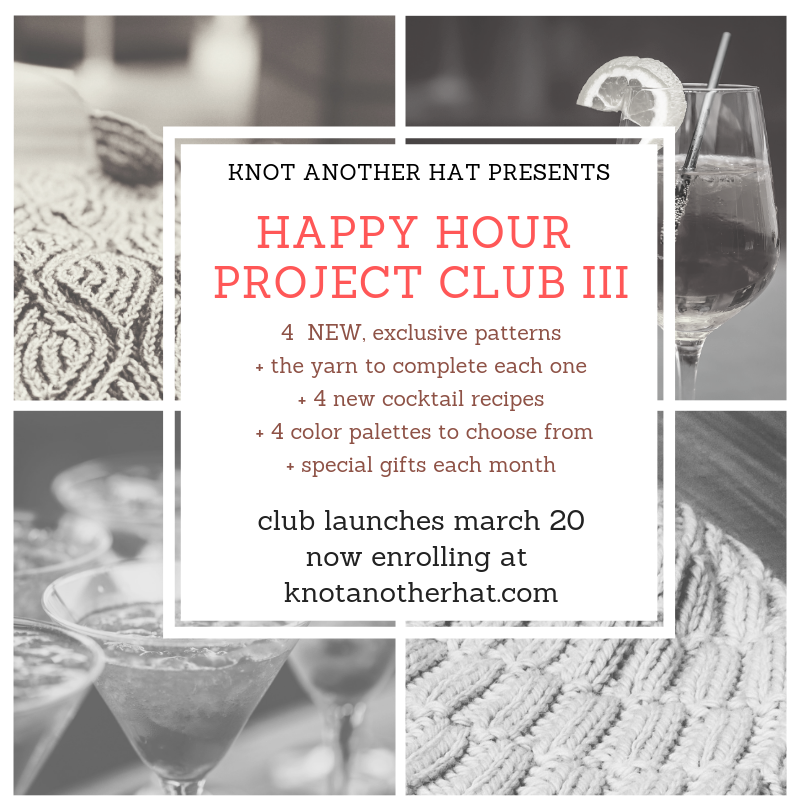 Knot Another Hat is at it again with the Happy Hour Project Club III - bringing you four fresh designs by Sarah Keller, the yarn to make them, four new cocktail recipes (and happy hours), and special treats along the way! Club members also get exclusive invites to each month's Club Happy Hour - where you can pick up your project, enjoy the month's special cocktail, and cast on with fellow club members! Happy Hours will be held Wednesdays March 20th, April 24th, May 15th, and June 26th from 5:30-6:30pm. To join the Happy Hour Project Club, all you have to do is choose Local or Non-Local (Local means you will pick your package up in-store each month, non-local means you would like your package shipped). Then choose your color palette (see thumbnails for a picture of each palette). These palettes serve as the inspiration for your projects' yarn colors, and are not exact representations of the colors that will be included in each project. Each project will reflect that palette's general "feel". Club patterns will not be available to the general public until 3 months after the club release date. Did you miss out on our previous Happy Hour Project Clubs? You can find all HHPC patterns on our Ravelry page. Special Notes: Designs are exclusive to Club Members for three months from release date. Skill Level: Advanced Beginner to Advanced. Two designs are perfect for Advanced Beginner knitters, one design will use stranded color techniques, and one design will use brioche techniques.